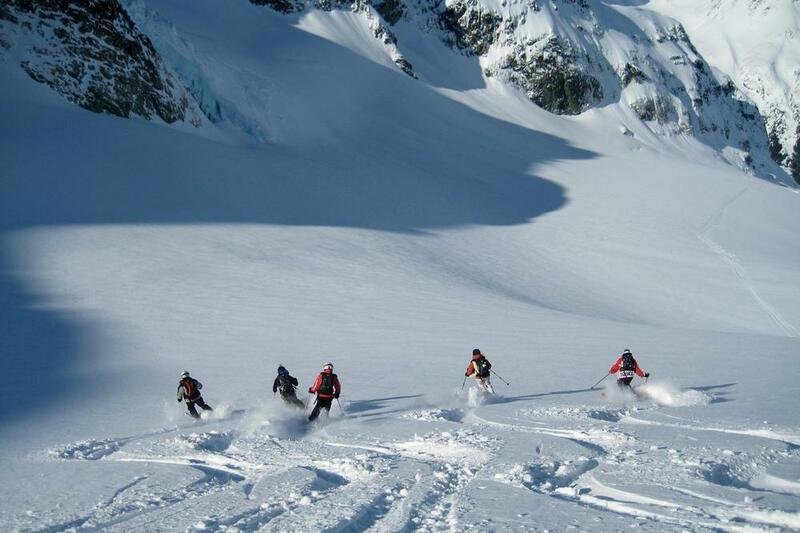 Ski resorts near Geneva are an obvious choice if you are planning a short break or ski weekend. There are numerous flights in and out of Geneva Airport each day from the UK (especially from the main London airports of Heathrow and Gatwick) which means that you can maximise your time on the slopes and minimise the time away. We look at the best resorts close to Geneva that would work very well for a ski weekend or short break ski holiday. With a flight time of just over an hour from London and a short transfer of an hour (or less) from Geneva to resort means you can leave your office on a Wednesday afternoon at 3.30pm and be eating dinner at your hotel in the Alps less than 4 hours later. Ski all day Thursday, Friday, Saturday and Sunday catching a late flight back to the UK on Sunday evening. Two days away from work and four days skiing on the mountain - it's no wonder that in a modern 'time poor' working life more and more clients are turning to the short break or ski weekend to get their favourite winter sport fix. When it comes to choosing the right resort for a short break the length of transfer is pretty important (although not necessarily the be all and end all). The shorter the transfer the better would be the obvious answer. However, consider this.... The nearest ski resorts to Geneva are located in the lower lying regions of the Alps and do not offer the best skiing conditions. We recommend spending a little extra time on your transfer to get to the higher, more snow-sure ski resorts. 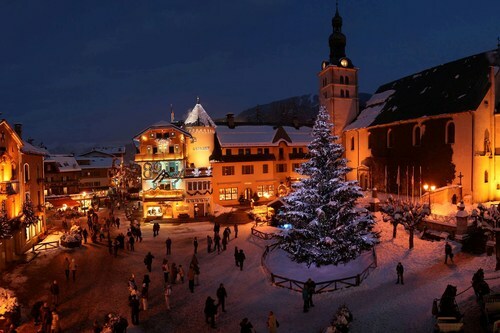 Megeve has been a winter playground for the wealthy ever since Baroness Noémie de Rothschild put in on the chic-ski-resorts-of-the-world map back in the 1920's. Today the resort features more luxury boutique hotels than you can waive a stick at and a fantastic collection of Michelin starred restaurants. As you might expect there is world class shopping to match with beautiful shops lining the quaint cobbled streets of the resort centre, all stocking the best brands. The large church of Saint Jean Baptiste (which dates back to the 11th Century) dominates the main square and along with the traditional horse-drawn taxi sleighs really gives the resort enormous charm (see the photo above). This is especially the case during the festive season when the large Christmas tree in front of the church is so spectacularly decorated and lit. The ski area is surprisingly large and best suited to intermediate skiers looking to cruise some good miles on the way to their haute cuisine lunch venue. Fur is pretty common place in Megeve - either on the coats of the pedestrians wandering around town or on the collars of ski jackets seen on the mountain. So make sure your ski gear passes muster. The resort is undeniably charming but a stay here does come with a bit of a price tag. However, if you are after a special romantic ski break there is hardly a better resort to choose. Chamonix lies in the shadow of the mighty Mont Blanc (4,808m), just one hour's drive from Geneva Airport. If you want to appreciate how big Mont Blanc is there is no better way than to see it through the eyes of some local mountain legends. Chamonix is a year round large valley town and has a real sense of place rather than just being a ski resort. Summer is the main tourist time of year for the resort which makes Chamonix good value for the winter months. There are plenty of bars and shops, the centre is pedestrianised, there is a casino, conference centre and train station. However, as it is a town and not a ski resort the access to the skiing is a little akward. There are free public buses that access the main lifts at Les Praz and Argentiere (about 8km up the valley) but these don't run as regularly as one might like and do take a while to reach their destination. However, once reached, the ski area (especially above Argentiere) offers some of the best high-mountain off piste terrain found anywhere in the world. There are a reasonable amount of pisted runs but those found on the northern side of the valley (facing the sun) are seldom at their best. The north facing pistes above Argentiere face away from the sun and present better skiing conditions on the whole. However, these runs are steep and often mogulled which means they are best suited to advanced skiers. The areas of Le Tour (beyond Argentiere) and Les Houches (at the western entrance to the main Chamonix valley) offer skiing for beginners and intermediates but these are a longer bus ride away from Chamonix centre. Morzine is an easy one hour drive from Geneva Airport, and on a good day (traffic and weather permitting) the journey can be as quick as 50 minutes. With a good range of inexpensive hotels and also some catered chalets that will accept a short stay during low season Morzine is a classic ski resort near to Geneva to choose for a weekend. The fact that it gives immediate access to one of the world's largest ski areas, the Portes du Soleil ('gateway to the sun'), has a vibrant après–ski scene and also plenty of good restaurant options just adds icing to the cake. Morzine is not a high resort and has not invested as heavily as other resorts into snow making facilities. Therefore it's best to visit sometime between mid January and mid March to ensure good skiing conditions. Being a lower altitude resort the ski area is largely made up of terrain which is alpine pastureland during the summer months. It therefore only takes a snow depth of 20cm to cover the grass and get the ski area up and running and for this reason December and April can give great skiing conditions. However, to be sure of the best conditions we advise that you plump for a stay during the low season periods of either mid January or mid March. Courmayeur lies at the southern end of the 11.6km Mont Blanc Tunnel in the Italian Aosta valley. The transfer time from Geneva is one and a half hours but the atmosphere and charm more than make up for the slightly longer transfer time. The main pedestrian street, the Via Roma, is where the charm of the resort lies and there is a good selection of bars, apres-ski clubs and restaurants. We sell competitively priced hotels with many clients opting for Bed & Breakfast stays allowing them to eat out in the evenings. The ski area is not massive but large enough for a short stay. It is mainly suited to intermediate skiers although there is a long off-piste itinerary route from the view top lift which experts will enjoy. You can also access the famous Vallee Blanche with a mountain guide although you will end up on the otherside of Mont Blanc requiring a taxi ride back through the tunnel to Courmayeur. La Clusaz is often overlooked as a suitable destination for a ski weekend but this very French and traditional ski resort has plenty to offer. The transfer time from Geneva is just over an hour which puts it within easy striking distance and the ski area, although a little fragmented, offers more than enough terrain for all abilities. There are a couple of good value three star and one or two pretty luxurious hotels in La Clusaz. Les Carroz is a lower lying satellite resort with direct lift access to the high altitude, large ski area of Flaine (with over 260km of piste). The north facing slopes of the (upper) Flaine ski area and the (lower) Morillon/Samoens ski slopes hold their snow well for beginners and intermediates, and on a powder day there are plenty of off-piste options for the experts. We feature several great value chalets which can often be booked on a short stay basis. Per person prices for a 3 night stay including scheduled flights, private taxi transfers and chalet board will start at approximately £560 (January 2017) so a short ski break weekend in Les Carroz can be very good value. The above are the pick of the ski resorts near Geneva that we recommend for a short ski break or ski weekend. However, we have access to hotels and chalets in other resorts that you may wish to consider. For keen skiers it might well be worth an extra hour in a transfer minibus to access the fantastic French ski resorts of the Tarentaise Valley. The Three Valleys ski area, and even Val d'Isere & Tignes, cannot be considered close to Geneva but are none the less very do-able for a ski weekend and of course offer world class skiing, apres ski and nightlife.